You'll be £10.00 closer to your next £10.00 credit when you purchase Till the Boys Come Home. What's this? This is a new edition of this classic book which includes, in its over 700 postcards, many new, powerful propaganda images from nations on both sides of this epic conflict. Here are cards from the Queen's Collection, cards from America, Australia, Austria, Belgium, Britain, Bulgaria, Canada, Czechoslovakia, Egypt, France, Germany, Holland, Italy, Rumania, Salonika, Serbia... All are faithfully reproduced from the original, whether in dramatic black and white or in exuberant colour and they are all at least 100 years old. But this is not just a picture book. This handsome and fascinating book uses hundreds of the immensely popular picture postcards of the '14-'18 period to document the course and effects of the Great War, with all its dramatis personae, its humour, suffering, patriotism, sentimentality and fervour. The first edition was in 1977, and many more postcards have been added to this edition. No expense has been spared, there is full colour throughout on top-quality paper and it's almost heavy enough to do duty as a coffee-table book. One can hardly imagine a greater contrast between these items initially sold at ½d each and now lovingly memorialised in this quality volume. I was fascinated - and for the right person it would make a super gift. A real pleasure to look at, if you have a love of images, be they via the brush, pen or developing tray, this book will really appeal to you. If you are looking for a different perspective of the Great War then look no further. Tonie and Valmai Holt and avid collectors of military postcards take the reader on a journey that is almost a window on the war... As a guide and study to the collection of period postcards it is essential. A welcome centenary reprint of a pictorial classic. This book documents the events and effects of the First World War with more than 700 postcards depicting the powerful propaganda images used by the nations involved in the conflict. These cards have been collected over many years and some are very rare and extremely valuable. 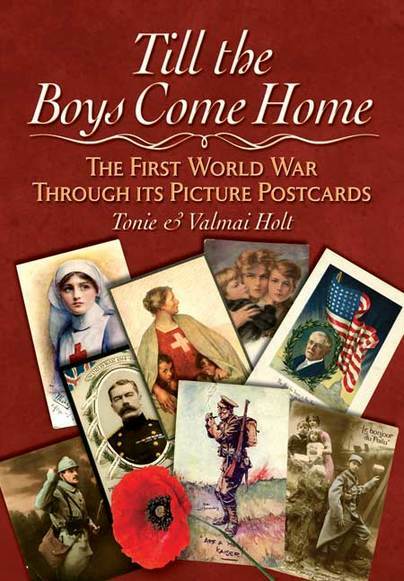 Till the Boys Come Home is an excellent book that you can look at time and time again enjoying every postcard in the knowledge that this is part of our history. I cannot recommend this book highly enough. This fascinating 330-page book, compiled by military historian Tonie Holt and his wife Valmai...documents the progress of the Great War with its humour, patriotism and sentimentality. 'Till the Boys Come Home' goes much further, recalling the widespread popularity of the picture postcard between 1900 and 1919 when nearly every household proudly displayed its postcard album... Each of the 700-plus images of the picture postcards carries a detailed explanation and the Holts, in this book, recount the stages of the long war that claimed so many lives in Europe and beyond. As long as there are coffee-table books like this, there will always be a market for good old-fashioned books like this; a book to hold and carefully turn the pages. I've not joined the Kindle revolution yet - although I've been contemplating it of late - but I can't imagine a coffee-table Kindle. This is, quite simply, lovely to hold, lovely to smell, lovely to read. The authors know their subject well and as someone who has, over the years, collected postcards, sold them, collected more, and more, and sold some more, I can thoroughly recommend this orderly and well organised study of these First World War era postcards. The book is published to the usual high standards that we have come to expect from Pen & Sword and the pages are packed with illustrations. There are some great artists here, some great humour - at a time when laughter was often thin on the ground - and helpful commentary. This is a book which would make a great Christmas present or indeed a present to oneself. It gets five stars from me and a huge pat on the back to all concerned with the authoring and production.